I first came across the Dogwelder in someones list of 'Lamest Superheroes'. Dogwelder was created by Garth Ennis and John McCrea in the pages of the Hitman series at DC Comics, presumably after using a lot of drugs. His 'superpower' was to weld dogs to the faces of his enemies. 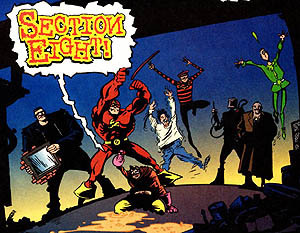 He was part of the completely insane Section 8, a team is based in The Cauldron, the Irish section of Gotham City and led by Sixpack. Sixpack: whose special ability is drunkenness and beating villains with broken-off liquor bottles. Dogwelder: A thin, silent man in a welder's mask who spot welds dead canines to the faces of evildoers. Bueno Excelente: An obese, sweaty, and bald Latin who "defeats evil with the power of perversion." The Defenestrator: A large, burly man in a denim jacket, black sunglasses, who carries around a window through which he forcefully throws his enemies. Jean de Baton-Baton: A bizarrely gaunt walking Frenchmen who defeats enemies with "the power of Frenchness," as expressed by savage beatings with a baton and blinding others with rings of garlic and onions. Phlegm-Gem: A sickly, thin, bald man in a green suit and a purple domino mask who has the ability to produce and expel large volumes of phlegm. Yuck! Shakes: A thin, hairy vagrant who upsets people through stutters and shaking. How terrifying! It has been suggested the group's name is from a section of the US Army Code which permits discharge from the service due to insanity (Section 8); the reference is deeply appropriate due to the psychological maladjustments of the characters. Another theory suggests the name of the team is a reference to Section 8, a program supported by the US Government to help the impoverished find affordable apartments. Dogwelder, the character was created by Steve Dillon (and an unspecified friend) in a pub when Ennis dared him to find a name even dumber name than Green Lantern. Whether his name also derives from "spot welder" (get it, Spot is a common dog's name) is uncertain It is also claimed that the word dog welder is a term used for the magnetron tube used to generate microwaves in a microwave oven. Allegedly, if these tubes are removed from the oven and energized they will generate enough energy to weld two dogs together. The character of Bueno Excelente was inspired by a Spanish pornographic movie in which the star's entire dialogue consisted of the word "Bueno..." repeatly, and then "Bueno... excellente!" upon the moment of climax. This was related to Ennis by a friend who had seen the film in Denmark. The Defenestrator, in both name and appearance, is a send upof the Terminators . Phlegm-Gem was likely named after a throw-away comment by comedian Bill Hicks in Sane Man. Dogwelder cited as one of Comic Book Resources' "Reasons To Love Comics"